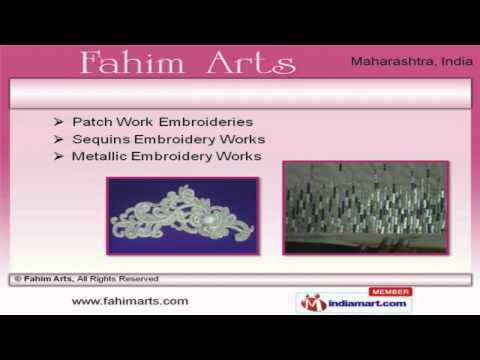 Welcome to Fahim Arts, Manufacturer and Exporter of Embroidery Products. The company was established in 2007 at Mumbai. UK and Kuwait are some of our major markets. Saba Kapadi and Goyal Garb are some of our prestigious clients and we are backed by Industry leading prices and on time deliveries. We offer a wide assortment of Gown Embroidery Works, Embroidered TShirts and Swarovski Embroidery. Our Patch Work Embroideries, Sequins and Metallic Embroidery Works are extremely reliable. We also provide Zardozi Embroidery Works, Motif and Thread Work Embroideries that are in huge demand across the global markets. We are highly instrumental in presenting a wide spectrum of Sarees and Kurti Embroidery Works that are cost effective. Superb in quality, appealing in designs, our Beading Embroidery Works and Beading Embroidery Work for Sarees are available at competitive prices. Our organization is highly involved in providing an impeccable range of Bridal Embroidery Works for Lehenga and Motif Work Embroideries for Kurti.